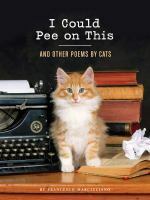 This hilarious collection of poems "by cats" has been a store favorite. If you are a cat lover this is a must have for your coffee table or anywhere where you need a book that you can pick up any time for a quick chuckle. Sign into Goodreads to see if any of your friends have read I Could Pee on This.